Isiah Thomas Returns Tonight. Yes, Him. Scott Smith of Pompton Plains, New Jersey, collects issues of Sports Illustrated. In fact, he has more than 40,000 copies of the magazine, including almost every edition dating back to the magazine's founding in 1954. Oh, and the vast majority of those issues — an estimated 94 percent of them — are autographed by the player on the cover. Smith — who's drumming up publicity for his other sports memorabilia auctions by offering his entire collection for sale for $1,999,999 — says he's spent between $300,000 and $400,000 tracking down the autographs, between travel expenses and purchasing copies already signed by athletes who have since died. He's gotten 99 percent of the autographs in person. He's scored autographs of everyone from Wayne Gretzky and Michael Jordan to Ben Hogan and the 1980 Miracle on Ice hockey team. Yet some signatures elude him. One is Bobby Fischer, the reclusive chess king who spent time in a Japanese prison and later refused Smith's request to grant him a meeting in Iceland, where Fischer lived at the time. Also not helping Smith is the fact that Fischer is now dead. But there's another athlete whose autograph has proven impossible to get: the mysterious figure known as Patrick Ewing. "It's just been a brutal, brutal autograph," Smith tells 1010 WINS. "He's tough." 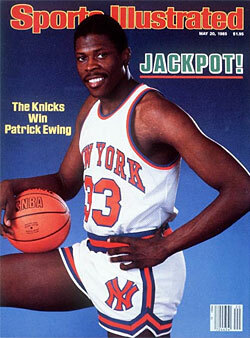 (A quick search of the Sports Illustrated archives shows that Ewing's been on the cover of SI an impressive thirteen times, either by himself or with others.) Should any obsessive autograph seekers be reading this, we can report that the seven-footer was last seen in the faraway land known as Oklahoma City, where he was ostensibly working as an assistant coach for the visiting Orlando Magic, but mostly dedicating his life to avoiding Scott Smith of Pompton Plains, New Jersey.